Ambassador Sanders joins Gallup for FEEEDS-Gallup 3rd Annual Event on Africa in Washington, D.C.
Gallup World Poll and FEEEDS Advocacy Initiative will host a curtain raiser July 14, 2016, in Washington, D.C. for President Obama's upcoming second U.S.-Africa Business Forum, which will be held in New York on September 21. 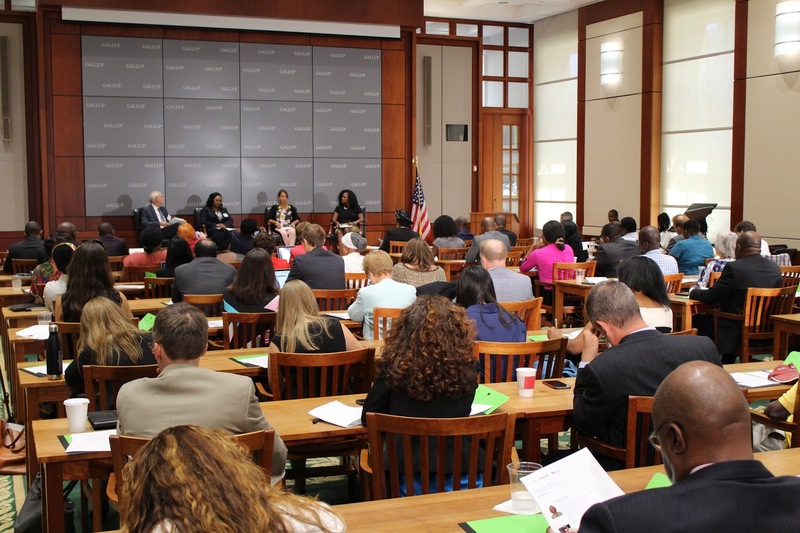 This third annual U.S.-Africa event sponsored by Gallup and FEEEDS highlights the centrality of Africa Diaspora Small and Medium Size Enterprises (SMEs) in job creation and development of the Continent's middle class. 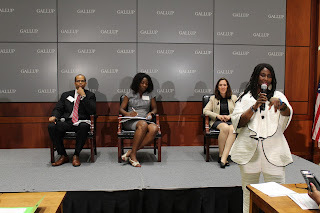 The forum, which is supported by media partner allAfrica.com and leading Africa energy and pharmaceutical firm GB Group Global, will take place from 1:30-4:30 pm at Gallup World Headquarters, 901 F Street NW in Washington, DC 20004. 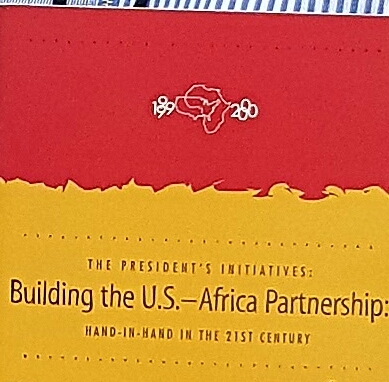 The event features presentations by President Obama’s Special Assistant and Senior Director for African Affairs Catherine E. Byrne, as well as senior officials from the Department of Commerce, the Small Business Administration, the U.S. Agency for International Development (USAID), the U.S. Chamber of Commerce, members of the President's Doing Business in Africa Council, and the African Center for Strategic Studies. Gallup Managing Partner Jon Clifton said the upcoming event "provides an opportunity for Gallup to share key polling data about the positive things happening today on the African Continent, from people being more upbeat about election processes to millennials in Africa having confidence to start their own SME business in their country of origin despite economic challenges." "For AllAfrica Global Media, which produces the leading online resource for news and information from Africa, this event provides an important ‘scene setter’ for the Obama business forum in New York, which is expected to draw broad participation from both Fortune 500 firms and American and African Small and Medium Enterprises,” said AllAfrica CEO Reed Kramer. 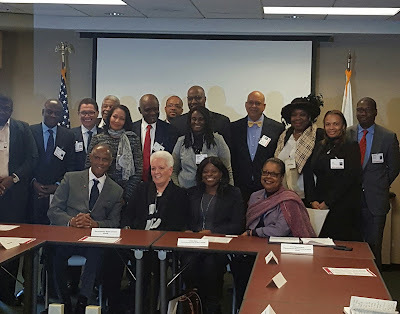 Ambassador Robin Sanders, CEO of the FEEEDs Advocacy Initiative and chief organizer of the event, underscored the importance of “bringing together both African and African-American SME businesses as one diaspora interested in doing business on the Continent." event on Africa Diaspora SMEs Forum. 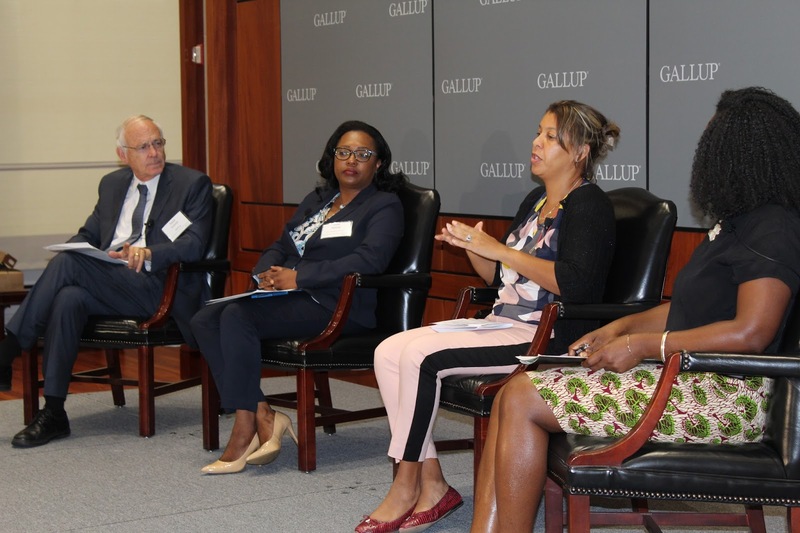 The Forum was held a Gallup's Washington, D.C Headquarters and focused on the importance and contribution of Africa Diaspora SMEs, which was underscored by polling data from Gallup. 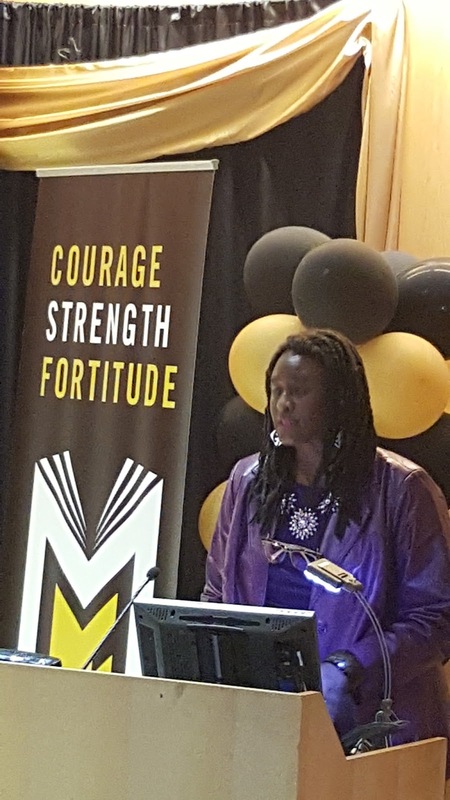 Assistant on Africa serving as the event's special guest. 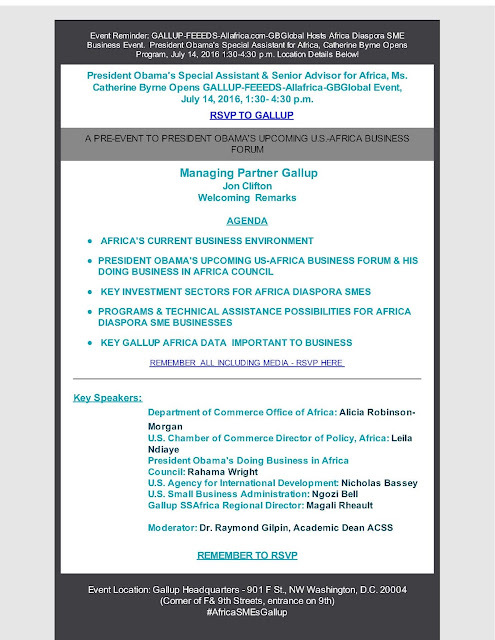 FEEEDS-Gallup-Allafrica.com Africa Diaspora SME Forum. 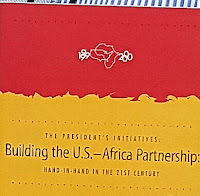 Ahead of President Obama's second U.S.-Africa Business Forum planned for New York on September 21, 2016, the FEEEDS Initiative —Food Security, Education, Environment-Energy, Economics, Democracy-Development and Self-help— in partnership with GALLUP, hosted the third annual forum on Africa in Washington, D.C. to discuss the importance and impact of Africa Diaspora small and medium size Enterprises (SMES) in the development of the Continent. Managing Partner, Gallup, Jon Clifton, introduced the featured special guest, Catherine Byrne, President Obama's Special Assistant and Senior Director for African Affairs at the White House. Other speakers included Alicia Robinson-Morgan, Deputy Director of the Africa Office at the U.S. Department of Commerce; Leila Ndiaye, Africa Policy Director, U.S. Chamber of Commerce, Rahama Wright, member President's Doing Business in Africa Council (PAC-DBIA) & CEO-Shea Yeleen, with Allafrica.com CEO, Reed Kramer, as moderator. 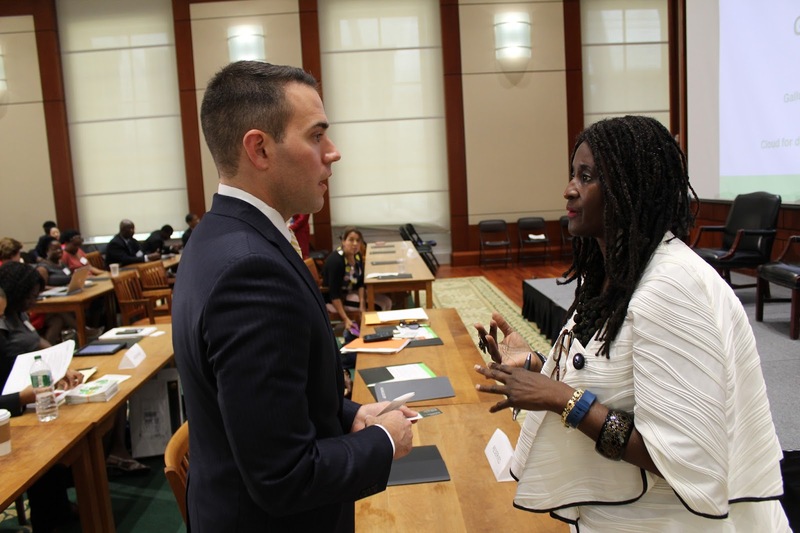 The hosts for the Africa Diaspora SME Business Forum were Jon Clifton, Managing Partner, GALLUP, and Ambassador Robin Sanders, CEO-FEEEDS. 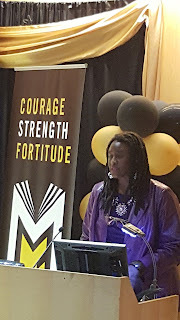 AllAfrica.com and GB Group Global led by Dr. Gloria Herndon were this year's featured partners. This is the third year Allafrica.com has been the media partner and the first that GB Group Global participated. In her opening remarks, Ambassador Sanders said the FEEEDS-GALLUP Africa Diaspora SME Business Forum represents an important step forward for high-level meetings in sharing practical and useful information to Africa SMEs, the state of the current U.S.-Africa business relationship, and Gallup's important data of the state of the Sub-Saharan Africa Region. "It also provides for a unique platform to highlight the role that Africa Diaspora SMEs are playing in the region's economic development, GDP growth, and spurring the middle class," Sanders said. 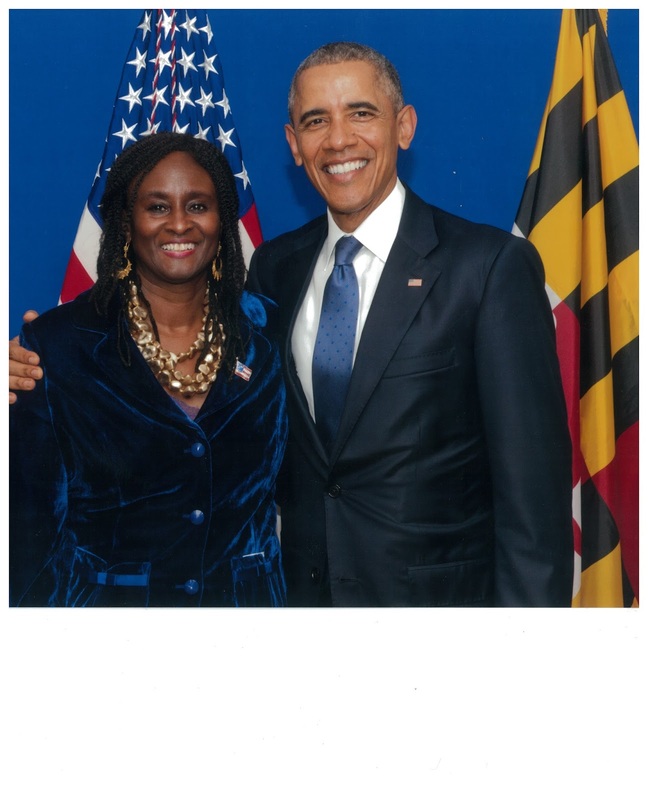 In her speech, President Obama's Special Assistant for Africa, Catherine Byrne, noted that despite huge security challenges, democracy and business growth have taken root in Africa and "there is progress." She said progress can be seen in several countries in Africa including places such as Zambia and Nigeria where exemplary general elections were held with winners and losers embracing peace or violence. She said the second U.S.-Africa Business Forum planned for New York in September 21, 2016 will solidify the Obama Administration's effort to not only increase US-Africa business ties, but strengthen the US-Africa relationship. Byrne identified some of the economic policies that have achieved results in Africa as the Security Governance and Trade Africa Initiatives, Power Africa, FEED the Future program, The Young Africa Leaders Initiative (YALI), the U.S.-Africa Business Forum, assistance setting up an Africa-like Center for Disease Control (which is already underway as a result of the Ebola outbreak), the Global Entrepreneurship Summit (GES), efforts to fight corruption, and the extensions of the African Growth and Opportunity Act (AGOA) for another 10 years – all will be part of President Obama's Africa legacy. 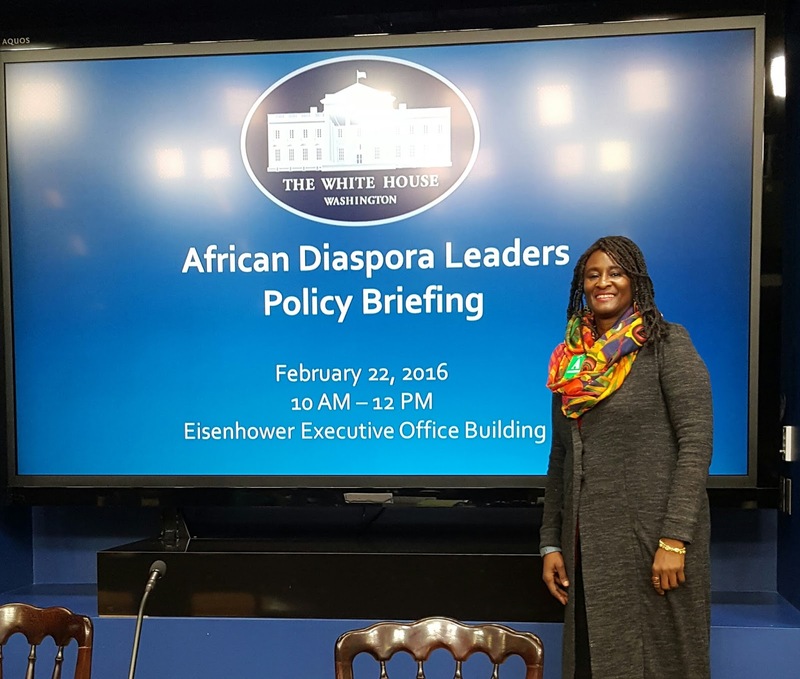 She highlighted these examples that we can all build on in response to questions about: what has been achieved; where is the US-Africa relationship going, and, what was next in the relationship. This was an incredible human being and role model for people of all nations and colors.One of the most interesting comments I heard today (June 4) was the unwritten impact that Ali had on today's American history just by virtue of changing his name. And, that name change by a person of his caliber likely set the stage in many ways for the mostly accepting manner in which enough Americans supported electing a President with the name Barrack Obama. Of course there were and remain outlyers who never were comfortable with either, but the majority elected not only this President twice, but the majority also revered Ali. These are the types of things in life that gives me hope and comfort in today's very dived America. 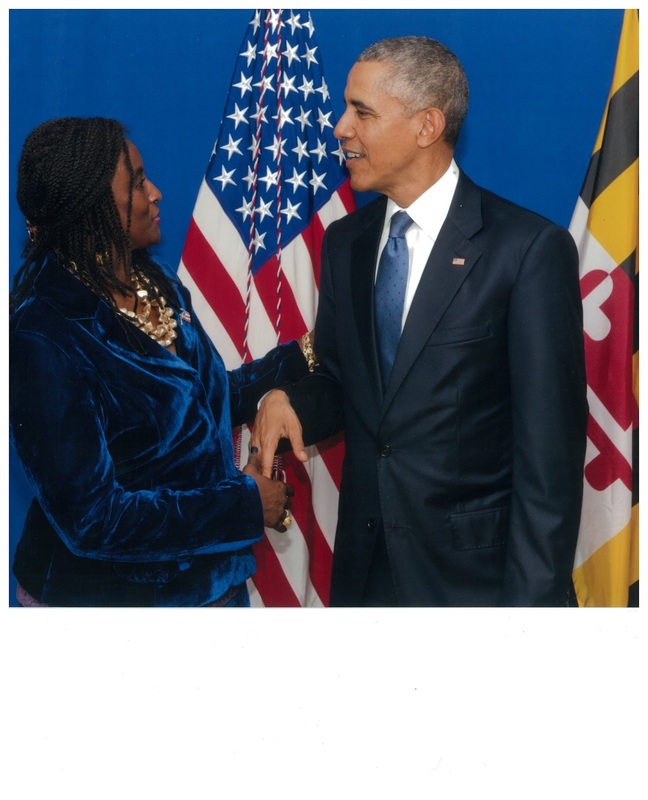 I had the rare priviledge to meet and talk to #The Greatest only once in my life time as a young diplomat at an gala event in Washington, D.C. (see photo). I had attended an event staffing another great #Ambassador Andrew Young, and was given the priviledge to walk Mr. Ali out as he left the stage. Ambassador Young took this photo and made sure I received it. (A thing I learned from Ambassador Young that day was to always be able to take your own photos, which I have done ever since). 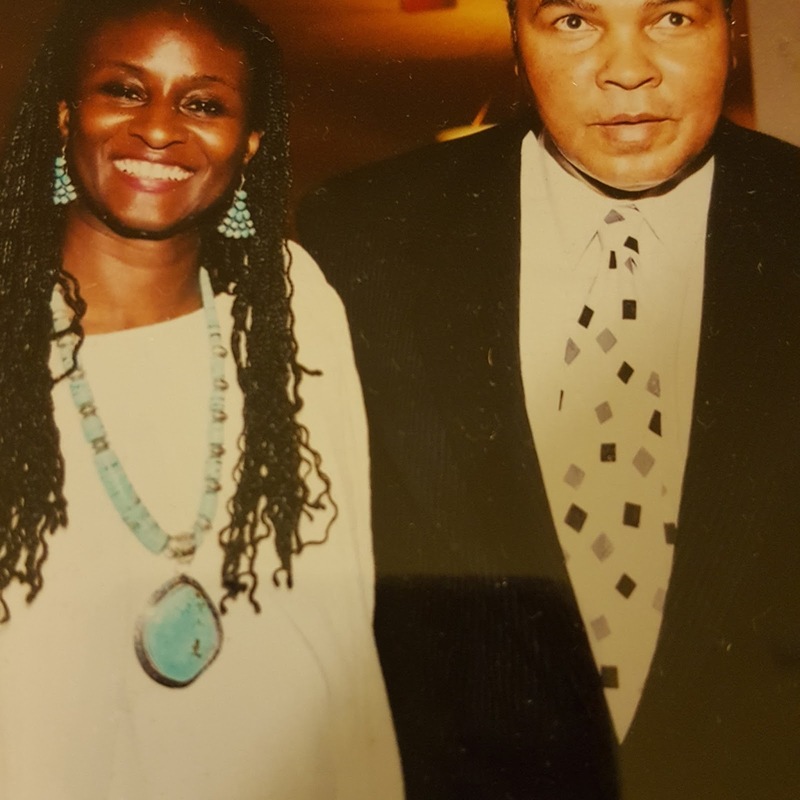 I always had in my Embassy offices overseas as I moved up the ranks in the US Diplomatic Corp, this photo with Ali, along with two photos of Ambassador Young swearing me in twice to serve as US Ambassador (Nigeria and Congo), and the photo of me talking to Nelson Mandela at his first #African Union meeting in Senegal following his release from Robbin Island. These four photos always had "pride of place" in my offices. May the Great Mohammed Ali rest in peace as we know he will be the "Greatest" whereever his spirit is today and always. Washington D.C. - Ambassador Sanders was the recent keynote speaker for Pittsburgh's Robert Morris University (RMU) National Security Seminar, which is part of the school's goal to provide its students with an opportunity to interact with national security subject matter experts in Washington, D.C. The seminar, held annually at The Washington Center, focuses particularly on current cyber security issues for its students, faculty and other guests who are part of, or connected to, the School of Communications and Information Systems. 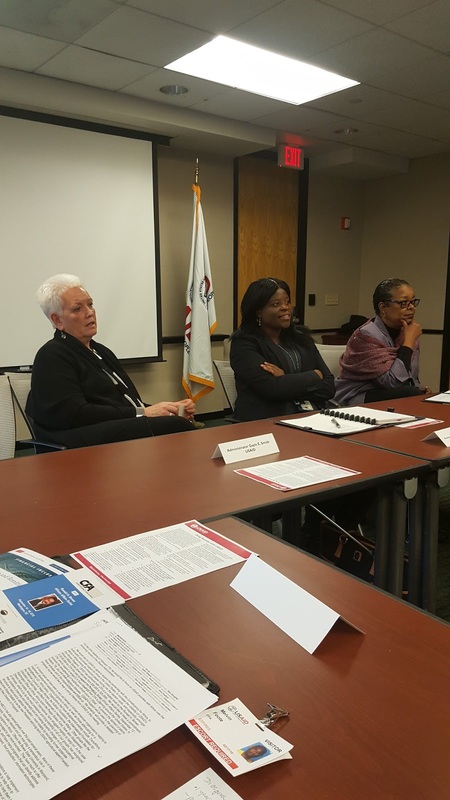 RMU, which is dedicated to ensuring its students have a global engagement awareness, invited Sanders, an alumnae of the University's doctoral program in information systems and communications, to provide her thought-leadership on the issue of cyber security and global development trends. 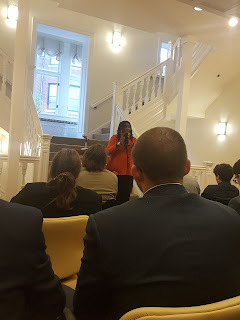 Ambassador Sanders discussed with students the key global development issues she saw, which had linkages to many people (certainly not all) being lured or forced into cyber security crimes, or participation in terrorist activities because of their dire economic circumstances or human condition. This, of course, excludes those who were and would be criminals or involved in terrorism no matter what. She noted, as an example, Nigeria's Boko Haram forcing many of its captives, particularly girls and young women, into acts of terrorism such as suicide bombings. Some of the global poverty issues highlighted in the discussion included terrorists using the Syrian refugee flux to Europe as a gateway to enter France and Belgium recently to execute terrorist attacks, and the long-term planning (at least two years) for the terrorist attacks in San Bernardino, California last year executed by an American and his Pakistan-born wife. Investigators are considering now if from the onset, the wife was possibly a terrorist sleeper-cell operative for the Islamic State. In all cases, the use of cyber and mobile platforms played a significant role. Possible other additional gateways for terrorists to use could also be the migrant flux from Libya as well as the new migrant and refugee gateway which has now opened from Alexandria, Egypt to southern Europe, Sanders also highlighted. Dr. Sanders, having just returned from Indonesia and Russia, noted that the U.S. needed to better help and assist friendly-partner developing nations, as well as some developed nations, with improving their security infrastructure and interagency coordination and cooperation, as well as try to be more than several steps ahead of countries the U.S. currently does not have a good relationship with such as Russia, or "frenemy" countries such as China. 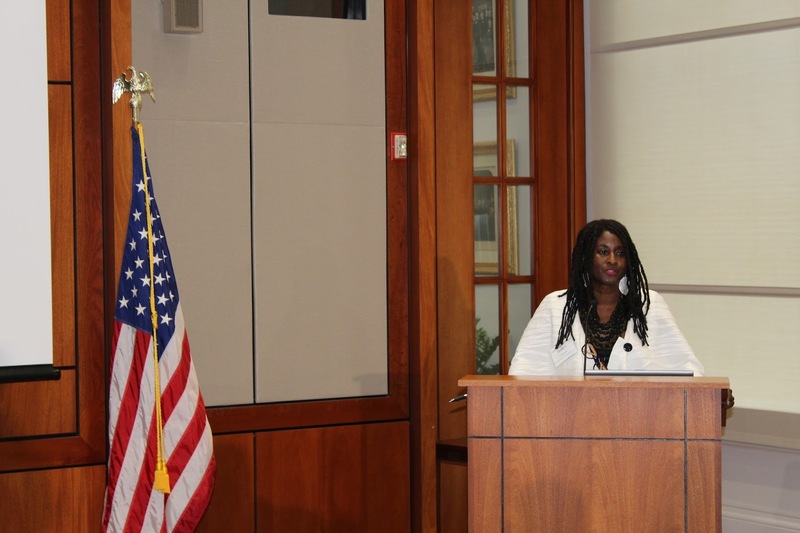 Ambassador Sanders was introduced at the event by the Dean of the School of Communications and Information Systems, AnnMarie LeBlanc. 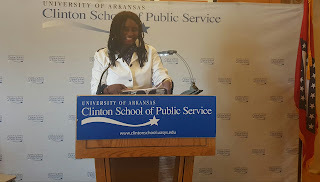 Little Rock, Arkansas - Ambassador Robin Renee Sanders keynoted a recent Clinton School of Public Service Policy Series event to highlight the importance of US-Africa Relations, particularly as a important friend and partner, as a region in which to build trade and business ties, as well as ally on efforts to counter terrorism. 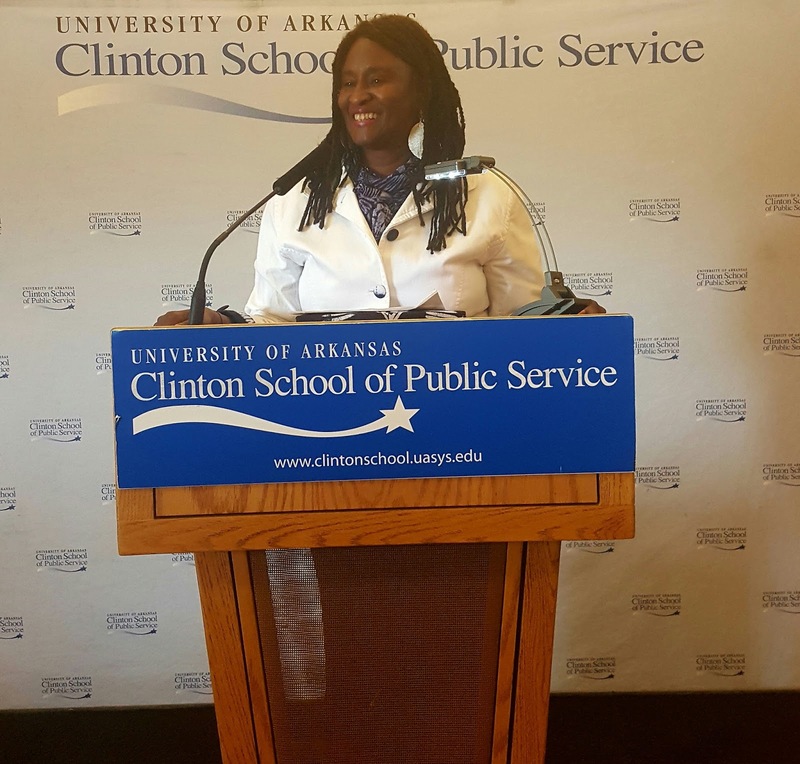 The audience included members of the public, Clinton School students, friends of the Clinton Library and former Clinton Administration employees and supporters. 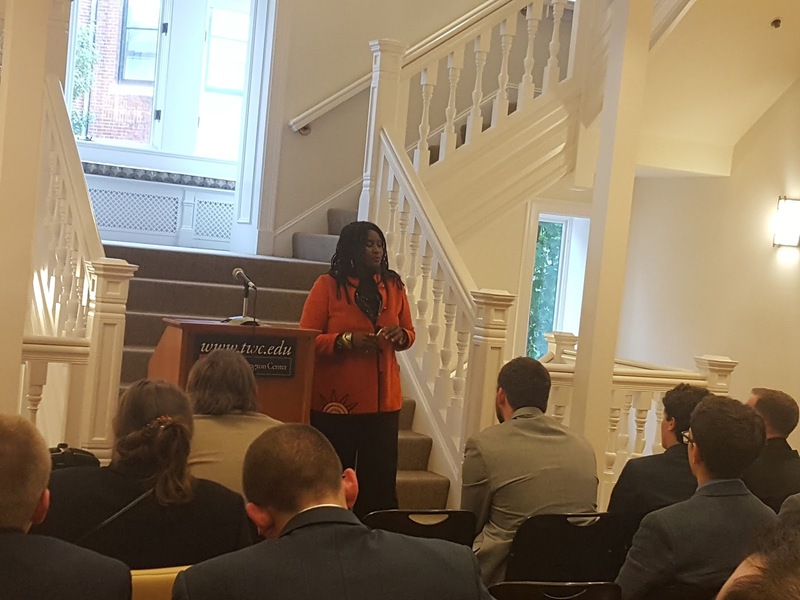 Following Dr. Sanders' speech, audience members asked a range of question about some of the positive areas she highlighted, including Nigeria's President Muhammadu Buhari is making on the issue. 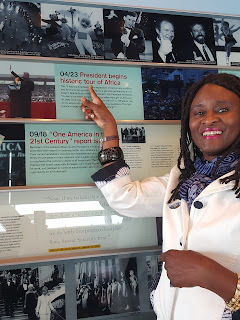 All of these efforts, were explained as being connected to assisting Africa in addressing the United Nations' Sustainable Development Goals (SDG's) to combat poverty to improve both the well-being and quality of life of the average African citizen; it was critical for the United States to help Africa nations achieve the SDG's. 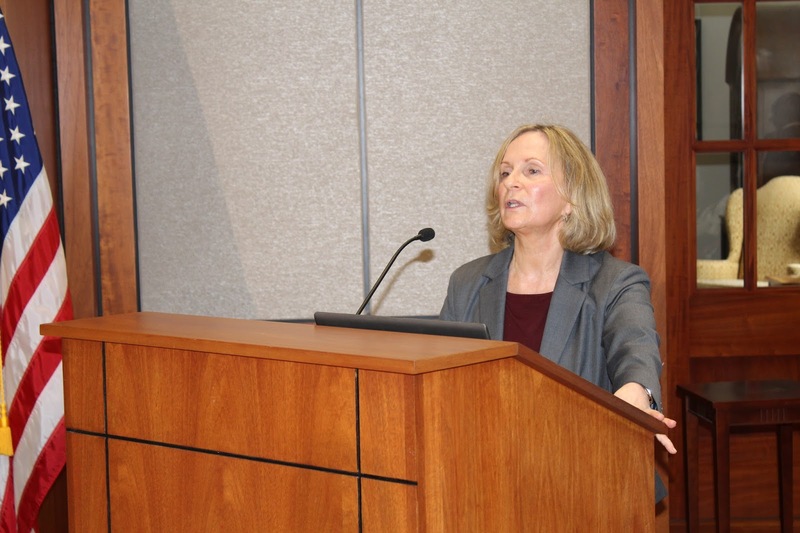 She also noted that in a recent discussion she had with students from her alma mater, Robert Morris University, addressing global development trends, it was important to be aware of the role some of these poverty issues played in Africa with people being lured or forced into cyber security crime and terrorism. Ambassador Sanders' also noted that there has been some backsliding in some African countries on the democracy front given the trend by some leaders to change, usurp, or amend their country's constitution to remain in power (i.e. referring to DRC's Kabila, Rwanda's Kagame, and Uganda's Museveni -- all president trying to, had a role in, or have done so). In her view, Sanders highlighted that Africa's Small and Medium Size Enterprises (SMEs) are one of the bright lights on the Continent as they find "work around solutions" to many of the Continent's economic development issues, and are helping address unemployment through job creation, and developing solution-oriented "apps" in key sectors like agriculture and health. 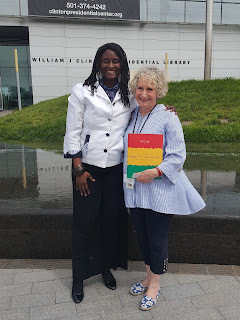 There was also a book signing event of Ambassador Sanders' "Legendary Uli Women of Nigeria," book focused on the importance of "communication expressions," of endangered sign and symbols systems, such as Nigeria's "Uli." In addition to the speaking event, Sanders received a VIP tour of the Clinton Library and residence, where at the former, she was able to view events she had worked on when she was Director for Africa at the National Security Council at the White House, especially her efforts on Clinton's first Africa trip, including the historic stop in Ghana (below left); and, Clinton signing the first Africa Growth and Opportunity Act in the White House Rose Garden. Ambassador Sanders also presented to her Clinton Foundation host a copy of the book she had complied while at the National Security Council (below center) on former President's Clinton Africa Initiatives for the Clinton Library. As we approach the end of Nigerian President Buhari's first year in office, sworn in before celebratory crowds looking for change (May 29, 2015), the country will be waiting to hear his list of accomplishments, but better yet his timelines for implementing the vision, which brought him into office. There seems to be two schools of thought on what type of report card his administration should have. Yes, there are critics who primarily complain about changes taking place way to slowly, but there are those that still believe the government is trying to do the right thing and want to give it time to get there. If you are wondering where I fall, well, I fall into the latter category – very much supporting the need to give the government the time it needs to make the sweeping, deep, and transformative changes that Nigeria needs and Nigerians want. Certainly, with any new government, there are fits and starts, and the Buhari Administration has had its own over the last 12 months, coupled with critical economic difficulties making it hard for the President to fulfill his campaign promises. There have been 2 steps forward and one back on things like confusion over the budget submission; the long wait for ministerial appointments; and, on the economic side, challenges in protecting its currency (the naira) from devaluation. The President strongly believes that devaluation will hurt the poor and help the privileged. Drop in global oil prices have hit the country's reserves hard over the last year, along with its ability to pay its bills, or move forward on social sector improvements, particularly health, education, and job creation. As of May 24, 2016, oil prices were at $USD48 barrels per day, still $10 off the country's 2016 benchmark, and most of the of last year prices fell between $USD27-36. Luckily the new budget's benchmark has oil at $38 per barrel. The list below list is not meant to be exhaustive but highlights some of the changes, followed by an analysis of their impact, gaps, and the expectations for Buhari's May 29, 2016 year anniversary remarks. -- Announced the extension of the Niger Delta Amnesty for ex-combatants through 2018. Looking at some of these key steps, what do they mean for Nigeria's bigger picture, keeping in mind that the President will have his own checklist of achievements and challenges when he makes his upcoming remarks? President Buhari is unshakeable on his quest to end corruption and his national and international reputation on this issue is virtually unmatched. His recent comment "what I am demanding is the return of assets" checkmated British Prime Minister David Cameron, at his own London anti- corruption conference, following his remarks that "Nigeria and Afghanistan are the most 'fantastically' corrupt countries in the world," especially in light of his father being named in the Panama papers. Not being deterred over the calls for an apology and keeping his eye on ball, gained Buhari further international respect for his steadfastness to get state assets back and stop corruption in Nigeria from "being a way of life." (NB: The World Bank 2015 Ease of Doing Business Report listed Nigeria 170 out of 189 countries rated for their lack of transparent and friendly business practices). At home, the Buhari Administration has had to institute some difficult economic policies to protect the naira such as tightening foreign exchange. Some of these steps are linked to his anti-corruption efforts to block ways in which money has been stolen over the years; cash money being was one of the biggest methods by either former government officials or others of removing funds for decades, or through inflated government contracts. So I get it. I know many businesses are feeling the pinch, but presumably these restrictions are short term for a few more months as the government fine tunes its checks and balances. As an example, in September of last year, the Buhari Government required all ministries to use their Central Bank of Nigeria (CBN) accounts, called Treasury Single Account for all government monies. Meaning, ministries cannot deposit government funds into commercial banks – a past practice where it is believed substantial state wealth disappeared. The other positive is that Nigerian companies have to provide the CBN with foreign contract information in order to obtain foreign exchange to pay clients or partners. All of these have been things in Buhari's anti-corruption tool box for both the country and foreign partners. Further on the economy is the question of the oil subsidy. Efforts to remove it in 2012 caused strikes which left the country paralyzed for more than a week (I was in Nigeria during this period), and strikes are being threatened again as the Administration try this again. Depending on what happens between now and President Buhari's May 29, 2016 anniversary speech, it will be important for him to better explain in order to convince the public to get on board. They are not onboard now, particularly since in his campaign he promised not to do. He may have to balance this decision to go forward with also providing some social sector benefit in return. I say this because the average minimum wage in Nigeria is about $USD90 (or 18,000 at today's official exchange rate), and the fuel subsidy is one of the few things on which the average Nigerian worker has been able to depend. This doesn't begin to address the impact it will have on those already at the poverty level where the average daily is about $1.25 per day, or for those unemployed -- as today's unemployment rate hovers 7.6 percent. That being said, the fuel subsidy is not financially sustainable for the country so educating the public, along with some out-of-the-box thinking on other types of affordable social sector assistance might help. Buhari's willingness to provide some "bailout funding" to ease the 6 month burden of unpaid civil servants wages was the right gesture. But the government does not having the resources to do more. The good will garnered on that is being tested daily as economic condition to toughen for workers. For a country which has Sub-Saharan Africa's (SSAfrica) largest population (estimated at 178 million) and its largest economy (Nigeria rebased in 2014), these are tough times for a country struggling to get its financial footing back, and keep investors engaged. We will look to President's Buhari speech in outlining his vision of the way forward on corruption issues, the economy, federal salaries, and jobs. In additions to actions on corruption and the economy, Nigeria's counterterrorism and military campaign against Boko Haram has had some gains over the last 8 months. The Nigerian military has retaken much of the territory that Boko Haram controlled and terrorized for more than two years. It is considered the most deadliest terrorist group in the world, overtaking the Islamic State. Nearly 800 civilians, who had been held captive by the group, have been either freed or found by the military. President Buhari also has used his international goodwill to further secure resources, and assistance from international partners such as the U.S. ( $250 million, through a variety of program); the United Kingdom (57 million); France, (with a pledge to provide, intelligence and training announced by President Holland in his May 2016 Nigeria visit); and, China, which rarely gets involved in these issues, saying it would assist in finding the Chibok girls. Equally, and emotionally more important to the families, to the country and to all who cared and worried about the 276 Chibok girls for two years, the return of two of them in May, gave hope that many more might be found or released. Certainly these changes and events are positive, but the threat by Boko Haram is far from being over. Boko Haram, as noted by the Department of State and the Global Terrorism Index, is one of the world's deadliest terrorist groups in the world. Furthermore the other issue that I stress from a national security perspective is that Boko Haram has "weaponized" more young girlsand women than any other global terrorist group. On internally displaced person's (IDP's), the number and needs are staggering, even though the Buhari Administration has provided funding to assist them, it falls well short (because the resources are not there) of the total monetary needs required to assist the 2.8 million IDP's. Going forward over the next 12 months, the Nigerian people, the families of the Chibok girls, and the IDP's in the north are going to want to hear in Buhari's speech what else is planned for the immediate future not only to improve the response to the IDP crisis; but what it plans to do to step-up its efforts to find the remaining Chibok girls, along with its continued military efforts to contain and combat Boko Haram. 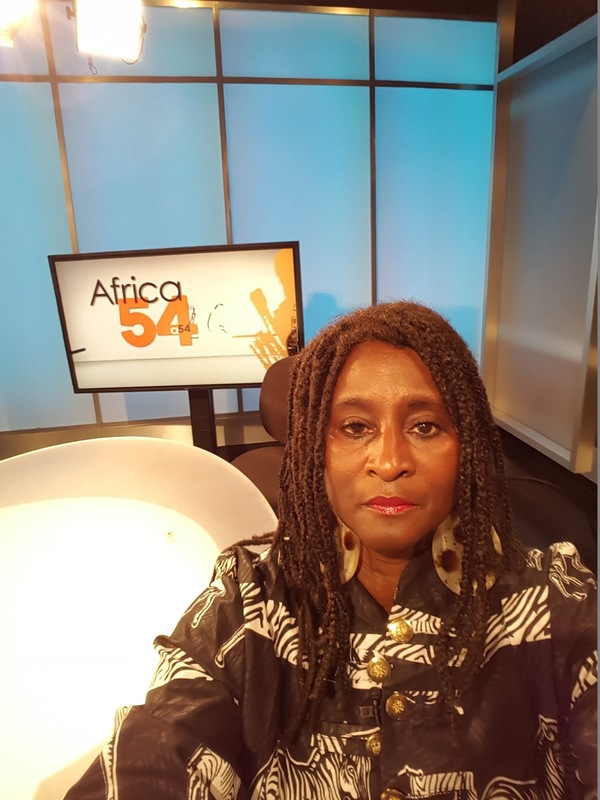 "The Sustainable Development Goals and What They Mean for Africa"